Alex King feels Luther Burrell’s recent fine form owes much to the Saints centre enjoying his rugby again. Burrell has been back to his bulldozing best during the past three weeks, starring in wins against Harlequins and London Irish and also carrying well at Newcastle last Sunday. The 28-year-old, who has been switched from 12 to 13, has formed a strong centre partnership with Academy product Harry Mallinder. And England were sufficiently impressed to hand Burrell a recall, with the Saints star replacing the injured Ollie Devoto in the squad on Sunday night. Burrell was released back to Northampton two days later, with his club happy to have him back ahead of Saturday’s crucial Aviva Premiership game against Worcester Warriors at Franklin’s Gardens. 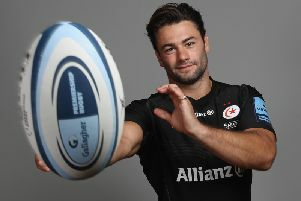 And when asked about the player’s recent form at this week’s media session, King said: “He’s really enjoying his rugby again and when Luther enjoys his rugby, plays with a smile on his face and touches the ball 10 to 15 times a game, he makes things happen. “He’s probably enjoying a bit more space in the 13 channel and it’s going really well for us. “He can use all his strengths in that 13 area. Lee Dickson is another player who has been reinvigorated during recent weeks. And King said: “He’s scored three tries in the past two games and he’s one of our leaders.